Graduated in 1952 from Unionville High School in Missouri, where he earned 12 varsity letters in basketball, football, track, and band, Gary Grabosch received All State football honors his senior year. He was a Northern Missouri All Star baseball player for two years and signed a professional baseball contract with the Kansas City Athletics in 1954. He received letters in football and tennis while attending Missouri Valley College and during his tour of duty in the military, played football and baseball at Fort Sam Houston in Texas. Gary received his B.S. Degree from the Southwest Missouri State and his Masters from the University of Arizona, has officiated various athletic events as a member of both the Missouri and Arizona Officials Associations. He coached various athletic teams at Townsend Jr. High (1967-70) and Rincon High School in Tucson (1970-92). His Rincon baseball team took the state championship in 1971 and was runner-up three times. They also won several Conference and Division Championships. 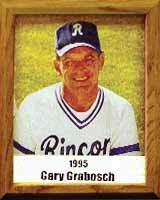 His overall record in baseball at Rincon was 263-188. Gary has been active in numerous community baseball endeavors such as American Legion; Connie Mack League; Big League; City League; Toros; Youth Winter League; and Summer and Winter League programs. He was named “Coach of the Year” by the Arizona Coaches Association in 1971.